In 2002, Peter Fischl received the prestigious “Hero in Education Award,” from the California Lottery. Most of the money raised by the Lotto, helps fund the state’s public schools. 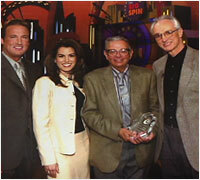 Mr. Fischl was given the award on a state-wide televised program called, “The Big Spin.” Pictured from left: Hosts Pat Finn & Maiquel Alejo, Peter Fischl and actor Michael Gross.